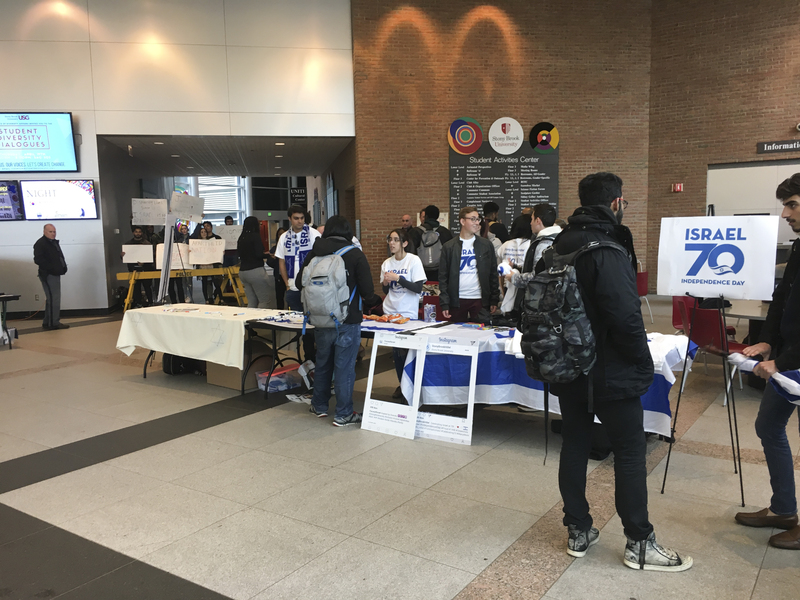 The Seawolves for Israel’s celebration of Israel’s 70th anniversary was met with protests from members of Students for Justice in Palestine (SJP), a chapter of National Students for Justice in Palestine that advocates for Palestinian rights and freedom. Hillel members who were at the SAC doubted SJP’s protests were productive. The conflict between Israel and Palestine has its roots in the Zionism movement that encouraged Jews to move back to what they consider their ancestral homeland in modern-day Israel. When the state of Israel was formed in 1948, the United Nations designated land for both Jewish and Palestinian states, but Israel came to occupy the West Bank and Gaza Strip after a series of wars started by its Arab neighbors over the coming decades. Shehran Uddin, a senior political science major and founder and president of Students for Justice in Palestine, said the club is trying to make the campus aware of Israel’s “true heinous nature” through protesting. Joseph Wolkin, Hillel president, senior journalism major and member of the Jewish Student Association, did not see the point in protesting the state of Israel by demonstrating at the event. Rabbi Joseph Topek, Director and Jewish Chaplain of Hillel Foundation for Jewish Life, said it was misguided and wrong to equate Zionism with terrorism. Rakia Syed, a senior biology and linguistics double major and member of SJP, said she has given up on changing Zionists’ minds. Richard Gatteau, interim vice president for student affairs and dean of students, said he encountered the event and the protest on his way to his office and chose to stay until the end. He later engaged with both clubs. Multiple officers from the University Police Department were also present to oversee the situation.